Visual communication covers a broad spectrum of tools and techniques that enable us to communicate through signs and visual messages. The video is probably one of the most popular means of visual communication in the 21st century because video capturing devices have become so easy to use, that even children can record a 4K video with their Smartphone or a webcam. Most laptops have built-in webcams that offer enough picture quality to enable video calls on Skype but lack the options for recording high-resolution videos. On the other hand, desktop computers rarely have built-in webcams, however, attaching a webcam to a PC is a straightforward process. Regardless of the type of the computer you have, if you want to produce high-quality webcam videos you will need a device that can capture footage in excellent resolution. In this guide, we are going to show you how to record webcams on Windows, Mac and Chromebook operating systems, and we are going to present to you the best webcam recording software options for a wide range of scenarios. Part 1: How to record videos with a Webcam on Windows OS? All versions of Windows that were made available after the initial release of Windows 7 in 2009, offer free applications for webcam video production. Both, built-in and external webcams require a software that can snap photos or capture videos. So, let's have a look at how you can record videos with your webcam on Windows 7, 8 or 10. Section 1: How to record from a webcam on Windows 10 or Windows 8? If you have some of the latest versions of Windows installed on your PC, then you can start using your webcam by accessing the Camera app. In order to locate it on your hard-drive as quickly as possible, you can simply insert the app's name into a search bar, and click on its icon once it appears in the search results. Alternatively, you can try launching the app from the Start Menu. After you've opened the Camera app, you will be able to see two buttons on the right side of the screen. One is for taking snapshots and the other enables you to record webcam videos. Capturing video's with the Camera app is easy since you just have to click on the Camera icon, in order to access the app's video mode, and then click on the same icon again once you are in the video mode to start a video recording session. The Pause and Stop buttons are located on the right side of the screen, next to the Record button, which makes pausing or stopping the video recording fairly simple. 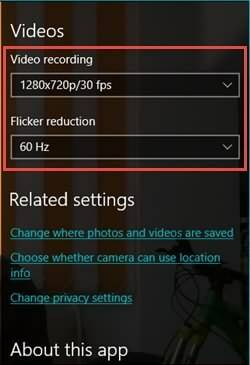 The Camera app, allows you to adjust some basic settings for each video capturing session, such as FPS or Flicker Reduction settings. In order to gain access to these options, you must click on the cog wheel Settings button located at the top of the screen. This action will take you to the app's Pro mode where you can also select the size of the video recording or adjust the frame rate for your next video. All videos captured with the Camera App will be saved in the Camera Roll folder, but you can change the destination to which the videos are saved, by clicking on the 'Change where photos and videos are saved' option. Note: The specific steps of capturing webcam video and changing the camera settings on Windows 8 may differ from that in Windows 10. Let's know in the comment if you have any questions. Section 2: How to record webcam videos on Windows 7? PC owners who have a Windows 7 installed on their computers, can use the Windows Movie Maker to capture webcam videos. The iconic video editing software can be accessed either from the desktop by double-clicking on its icon, or from the Start menu. After you've launched the software, make sure that you are in the Home tab, and locate the Webcam Video icon. Clicking on it will enable you to use the basic video capturing tools, this software provides. You can start recording by clicking on the Record button, or use the Stop icon to conclude a webcam recording session. Users that can only see a black screen when clicking on the Webcam Video option, must make sure that the software is using the right webcam. In order to do so, you need to open the Home menu and click on the Options feature. Once the new window pops out on the screen, you should select the Audio and Video setting and then proceed to choose the webcam from the Available webcams drop-down menu. Section 3: What if your PC doesn’t have a webcam? Even though nearly all modern-day laptops have built-in cameras, the same is not true for powerful desktop PC configurations. There are three different options at your disposal if you don't have a built-in webcam on your computer but you still want to create webcam videos. Before you can turn any video camera into a webcam, you must first make sure that the device supports this option. We recommend you to check your digital camera User Manual to confirm it before continue. Afterward, you should install all the drivers and software required to use a video camera as a webcam, and then connect it to a computer via the USB cable. Some action cameras such as GoPro cameras can capture high-quality videos and they are easily turned into webcams. Using AC adapters to ensure that your battery won't run out during the webcam video recording session is advised because this process drains the camera's battery quickly. You can also connect an external microphone or use the camera's mic by connecting the camera's audio jack with an Audio-in on your PC. Turn the camera on and head over to My Computer. Click on the video recording device that is attached via the USB, and start capturing your webcam video. PC owners who don't have a webcam can utilize their Android phones as video capturing devices, although they need to have the appropriate software installed in order to successfully turn a Smartphone into a webcam. There are a lot of different apps you can find on Google Play that enable you to connect your Android phone to a computer and use it as a webcam, but in this guide, we are going to show you how to capture webcam videos with a DroidCam Wireless app. 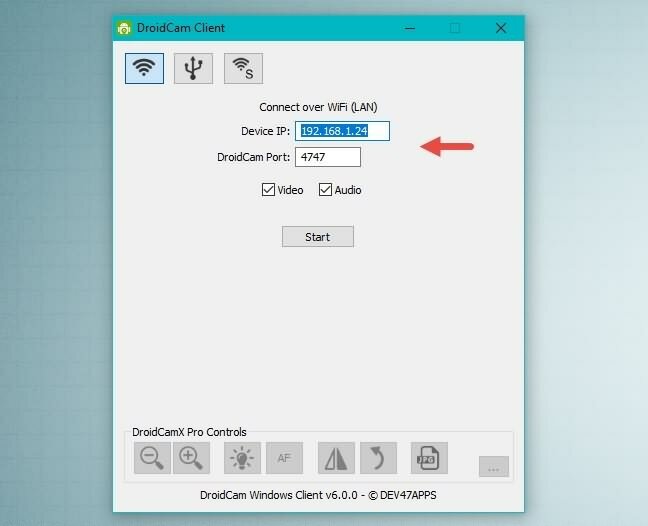 Go to Google Play to download and install the DroidCam Wireless app on your Android phone, and then proceed to install the DroidCam Windows Client on your PC. After you've completed the installation process, you can start connecting the two devices by launching the DroidCam Wireless app on your phone. The app will display the WiFi IP and DroidCam port information, memorize them because you will need each of them to successfully connect your Android phone to a PC. Commence the video chat session or record any other type of video you want. You can end the recording session by clicking on the Stop button. Pros: DroidCam app enables its users to easily turn their Android phones into a webcam, that produces videos without watermarks and free of charge. Cons: Even though the app lets you capture videos in 720p HD resolution, it doesn't allow you to choose the video recording settings. Vloggers and YouTubers who want to create tutorials, software walkthroughs or gameplay videos on a constant basis should consider purchasing a peripheral webcam. Using a digital camera or a Smartphone as a webcam has its limitations, which is the reason why an external webcam can assist you in creating smoother video chats and enable you to produce 4K or 1080p webcam videos. The market is oversaturated with different camera models, that offer a wide range of different video and audio recording options. Before you buy a webcam you should find out more about the features of the particular model you are interested in. The product's price often speaks a lot about its quality, and for that reason, lower-priced cameras provide fewer video recording options, while webcams that cost nearly a hundred dollars or more deliver better performances. The size of a video, as well as the maximum frame rate value and a number of other video recording options, should also play a role in your decision to buy a webcam. Logitech's products have dominated the webcam market since the early 2000's, and that's why it is hardly surprising that Logitech's C920 webcam is one of the premier options for a peripheral webcam. C920 model produces videos in Full HD 1080p resolution on Skype and HD 720p resolution when used on FaceTime for Mac devices. The H.264 encoder reduces the size of the video file the webcam is producing and shortens the amount of time required to upload the video online. The audio recording options Logitech C920 provides are above average since two stereo microphones ensure that sound in your webcam videos is natural and clear. C920 model costs just $79,99 which makes it both affordable and powerful choice for anyone who wants to record videos with a webcam. Part 2: How to record webcam videos on Mac computers? Having video calls or capturing any type of video is remarkably easy with all Mac computers of the new generation. The software for webcam video capturing is bundled and available for free, on most Apple's products, so you just have to switch on your webcam and start recording. QuickTime Player is featured on a wide range of Mac models, and it lets you create a video with a webcam in a few simple steps. Click on the Spotlight's desktop icon that looks like the standard search symbol and type in QuickTime into the search bar. Double-click on QuickTime's icon in the search results, and wait for the software to launch. Open the File menu in the QuickTime's main window and select the New Movie Recording option from the drop-down menu. At the bottom of the QuickTime's window, the Recording icon will appear, click on it and start recording a webcam video. Hit the Record button once more when ready to complete the session. Head back to File drop-down menu and choose the Save option. You can change the video's file format from MOV to MP.4 or insert a title before clicking the Save button and starting the Export process. QuickTime also enables its users to record their screens, while capturing webcam footage simultaneously. Here's how you can create a screencast on a Mac computer. Open the QuickTime application and click on the File menu. Select the New Movie Recording feature and the head over to the View menu. Make sure that the Float on Top feature is selected. Enabling this option ensures that the webcam window will be displayed over all other active applications. Adjust the size of the camera window, you can resize it in any way you want and place it anywhere on the screen. Return to the File menu and click on the New Screen Recording option. Once the Screen Recording window appears, you'll be able to designate the area of the screen you'd like to record and hit the Record button to start creating a screencast. Press Command, Control and Escape keys at the same time to stop the screen capturing session and proceed to save or edit the video you created. Part 3: How to record videos from a webcam on Chromebooks? The Camera app is featured on most Chromebooks, but if for some reason your device doesn't have the Camera app you can download it from Chrome Web Store. Although the app allows you to take photos it doesn't offer video recording options. You can try downloading the Hippo Video or Loom applications if you would like to create screencasts, capture webcam videos or quickly edit the footage before sharing it on social media. Recording videos in Google Docs, editing from Google Drive, or tracking the numbers of views the video is getting are just a few out of many options these applications for Chromebooks provide. We will discuss some of the best online webcam recording software for Chromebook later in this article. You can click here to go to it directly. If you are using a HP chromebook, you can check this article to get the detailed information about record webcam video on it . Now, you have already know how to record a webcam video whether you are using a windows laptop or desktop, or Mac, or a Chromebook. Now we want to introduce some best webcam recording software for helping you creating a more creative webcam video on different platform, whether you are using a Windows PC, a MacBook, a Linux, or a Chromebook. Most people think that webcams can only produce entertainment videos, when in fact they can be used to capture a wide spectrum of different types of videos. Business presentations, software tutorials, gaming videos, to name a few, can all be recorded with a webcam. The list of features a webcam offers only partially determines how good the final product will be because it is the webcam video recording software that actually enables you to fine-tune the settings of each recording session. Some webcams have their own webcam recording software, that provides an alternative to the Windows' Camera app or Mac's QuickTime Player. However, webcam recording software products manufactured by the same company that made the webcam often lack key video recording features, which complicates the webcam video recording process. Luckily, there are numerous webcam recording software products available on the market and we are going to take you through ten best options you can find on the market. So, let's dive in. The software's cross-platform compatibility makes it a great option for both PC and Mac users. The feature-packed webcam recording software lets you create gaming streams, green screen videos, or produce screencasts. You can switch between as many as twelve different audio, photo or video sources while broadcasting videos on a wide range of video streaming platforms. ManyCam features countless effects, masks and text overlays that can be used to create webcam videos that match the professional standards. In addition, the software allows you to doodle over videos during the live broadcast using some of its drawing tools, while the RTMP option lets you broadcast live events on UStream, Twitch or YouTube platforms. ManyCam software is an excellent choice for experienced video content creators, but novice webcam video producers may find it a bit difficult to use, at first. CyberLink's webcam video recording software product is equipped with a lot of effects that can help you make more entertaining videos. YouCam lets you add virtual makeup to the webcam videos so you can look your best at every business meeting. Over two hundred visual effects, as well as the broad spectrum of frames, scenes and emoticons, make this webcam video recording software a perfect tool for video calls. However, YouCam also offers advanced options such as complete support for PowerPoint video presentations, desktop capturing at high frame rates or even safety tools for face login or child surveillance. CyberLink's software features a photo editing mode that enables its users to create profile pictures for social media accounts or to manipulate images with its powerful photo editing tools. The process of creating a webcam video can be a lot of fun, especially if you are using a webcam video recording software like Magic Camera. This program for PC computers can be used with almost all popular chat apps like Skype, Windows Live Messenger or AOL. You can replace the background of a webcam video while recording, add masks, sunglasses or hats via the webcam face tracking feature and even type text on video. Magic Camera enables its users to create PIP videos, apply fully customizable effects or paint on the webcam video. In addition, the software lets you take photos and create goofy social media profile pictures, while also providing audio editing options. Even though Magic Camera is very easy to use, it lacks the features necessary for the creation of professional webcam videos. Making your video chats more interesting is easy with SplitCam because the software contains a rich library of amazingly cool visual effects. In addition to awesome effects that can brighten up every video call, this webcam video recording software also provides realistic 3D masks, that can be used to replace an entire head with a Dart Wader mask. The largest video file SplitCam can produce has 2048X1536p, but the software also provides a large number of different video file sizes. You can use a webcam with several active apps at the same time without receiving the 'webcam busy' message, normally displayed when trying to give access to your computer's webcam to multiple applications. SplitCam is compatible with most video chat platforms, including Skype or Google Talk. The color correction options iGlasses software delivers are worthy of advanced screen capturing or video editing apps. Its users can easily control Exposure, White Balance, Sharpness, Brightness or Saturation levels on each webcam video they record with this software. iGlases can be used to enhance videos on FaceTime or to add effects to videos on web-based chat applications like Facebook video or GTalk. The rich selection of video effects also includes 3D effects and face tracking, which allows you to create entertaining webcam videos. The Zoom feature enables you to precisely set how wide the angle in your webcam video should be and control what should and shouldn't be visible in the shot. The Pan option, on the other hand, lets you create more dynamic webcam videos that contain camera movement. Logitech's webcam software is as reliable as its webcams, and it enables you to utilize the full potential of the Logitech's webcam model you are currently using. If you purchased a Logitech's webcam, you probably received a webcam software installation disc, so before you start capturing webcam videos you must first install all the webcam drivers as well as the webcam video recording software. Each Logitech's webcam model is compatible with the different software, which is the reason why you must check the software's and webcam's compatibility prior to starting a video chat or a screencast. The majority of Logitech's software products enable their users to capture both photos and videos or apply fun video effects and filters to their newly created webcam videos. Gamers, vloggers, YouTubers and all other webcam video enthusiasts are going to love using this screen capturing software. FilmoraScrn lets you adjust screen recording settings quickly while at the same time allowing you choose whether or not you want to capture footage from the webcam. Depending on the quality of your webcam, you can also increase or decrease the size of the webcam video or change the frame rate. The software also features a video editor that can be used to remove unwanted parts of webcam video or a screencast you've created in the Screen Capturing mode. In addition to basic video editing tools, Filmora Scrn also enables you to separate video and audio files or add music to videos. The Wondershare's screen capturing software allows you to export your projects to YouTube, Twitch or Vimeo directly from the editor. The number of different video file formats Debut Video Capture supports makes it one of the best webcam recording software products on the market. In addition to remarkable webcam recording features, the software also enables you to record a screen, record from peripheral webcams or even schedule a video capturing session. Debut Video Capture lets you designate the area of the screen you want to capture and it allows its users to record video and audio separately. Text captions, as well as the basic color enhancement features, are on the list of features this webcam recorder offers, but professional video capturing tools and options are not available. The software's export options enable users to export videos in 1080p HD resolution. The latest version of SmartPixel, well-known screen recording software has brought significant changes, including the software's name. If you opt to install GoPlay on your PC or Mac computer, you'll be able to create screencasts, capture webcam videos or record the gameplay of your favorite video games. The software lets you produce 4K videos at 60 fps, while the Picture in Picture options enables you to create professional looking vlog entries on your YouTube channel. The software's video editing mode features a multi-track timeline that lets you use a separate track for each new media file you add to your project. Visual effects such as transitions, text overlays or filters can be used to make your videos stand out and gain the recognition they deserve. Even though VLC is known as one of the best media players ever created, it can also be utilized to capture webcam footage. The software allows you to select a webcam and create a stream, but the setup process is a bit technical and requires some previous knowledge about webcam videos, and for that reason, VLC Media Player may not be the best option for inexperienced webcam video creators who just want to produce entertaining videos. VLC doesn't offer any live video effects you can apply to videos during the recording session and there are no video editing features to speak of. Despite these significant disadvantages, the VLC media player is still one of the best cross-platform options for webcam video recording. Like so many of the webcam video capturing apps designed for Windows and Mac operating systems, Cheese offers a rich collection of visual effects that can be easily applied to videos during the recording sessions. The software also enables you to snap photos, in a single picture or burst modes. The Cheese app lets its users capture videos with several webcams at the same time, and its UI is optimized for Netbooks and all smaller screens. The video output sizes this open source webcam recording software offers are limited, and you won't be able to choose your preferred frame rate. Even though the Cheese application allows you to export photos to Flickr or to a GNOME account, the software doesn't enable you to export your webcam videos to some of the world's largest video sharing platforms. This open source screen recorder also lets its users capture webcam videos. All recordings are in the AVI file format, but they can be easily converted to Streaming Flash videos that are perfectly suited for broadcasting webcam videos online. The CamStudio is equipped with a Video Animation feature that makes it easy to create PIP and all other types of videos. The software lets you add screen captions; designate the area of the screen you'd like to capture or use custom cursors in your projects. However, the audio recording features CamStudio offers are modest, and its video output features don't include some of the most popular file formats such MOV or MP4. You can use this software to record webcam videos, but don't expect too much from this simple screen recording tool. Mac and PC owners who don't want to invest in a webcam recording software can capture their videos using online webcam recorders. This is a perfect solution if you want to record a video quickly, without having to go through the long video editing process. In order to start recording a webcam video with this application you just need to allow it to access your webcam and the microphone, you intend to use during the webcam recording session. The Settings menu, located in the lower right corner of the screen, allows you to select the video file size and to manually select the video and audio capturing devices you will be using to record a webcam video. After you've successfully completed the webcam recording session, the application will allow you to save the file you created to your computer, but Video Recorder doesn't offer any video sharing options. The online webcam recorder also doesn't offer any visual effects, text overlays or annotations, which is the reason why all interventions on the footage must be made after the video has been recorded. The free version of ClipChamp allows you to record five-minute webcam videos, while the Business paid version lets its users record videos that last up to thirty minutes. Even though the Basic option allows you to capture as many videos as you want per month, all videos recorded with the free version of ClipChamp contain a watermark. All users of this platform must first create an account before they can start capturing videos with their webcams. Despite these disadvantages, ClipChamp still enables its users to create videos in 1080p, 720p or 480p resolution and it lets them select an external microphone and webcam. The platform provides basic video editing features, and it allows you to export webcam videos to Facebook, Google Drive or Vimeo. ClipChamp is compatible with Chromebook OS, so webcam video enthusiasts can use it to record videos from their Chromebook devices. Anyone who owns a webcam and a computer can use this platform to capture any desktop activity or produce webcam recordings. You just have to download and install the Launcher and you are ready to start recording. The free online screen recorder lets you choose whether you want to capture a screen or use a webcam to record the video. However, it doesn't allow you to record desktop activities and webcam videos simultaneously. Capturing multiple webcam videos at the same time on video chat platforms such as Skype is on the list of options this screen recorder provides. The Apowersoft free online screen recorder can capture webcam videos in MP4, MOV or FLV file formats while enabling you to edit the webcam videos during the recording session. You can export your webcam videos to YouTube, Google Drive, or Vimeo as well as save them to a hard drive on your computer. Sometimes having the latest webcams that produce HD or 4K videos and the webcam recording software that provides a lot of different tools and options don't mean much because the audio quality is terrible or the recording is too dark. Here are a few tips that can assist you in creating well-rounded and professionally recorded webcam videos . Even the best webcam models feature microphones that easily pick up background noises. Although you can use the audio and video editing software to remove background noises, the results you'll be able to get will be far from impressive. Instead, you can try recording audio with an external shotgun microphone that only picks up sounds that come from the direction in which it is pointed. Capturing high-quality audio recording may not seem as such an important part of the webcam recording process, but no one wants to watch videos with a terrible sound. Placing a webcam in the desired position is not so easy when using built-in webcams, but peripheral webcams can be easily placed in a location from which they capture a perfect shot. Most videos recorded with webcams use a single camera position which makes the shot selection even more important. A skillfully composed shot can help you to create a dynamic video that is also visually pleasing. Paying attention to every little detail in the shot will enable you to remove anything from the background or the foreground that might distract the viewer. Under or overexposed videos will hardly attract anyone's attention, because the viewer can hardly see what is going on in the video. Try to keep away from windows and other sources of bright light, since they might make parts of the shot look too bright while the others remain dark. Insufficient lighting in a webcam video is just as bad as having too much light in the shot, so make sure that the main protagonist of your webcam video is always properly lit. The webcam recording software can also be used to reduce or increase the webcam's sensitivity to light. The quality of the webcam recording you are producing depends on the highest video quality the webcam can capture and the highest video quality webcam recording software supports. Most webcams of the latest generation can record 720p HD videos and in order to make sure that the webcam is recording a video in the maximum resolution you have select the proper video size before you start webcam recording session. High-end webcams can record 4K videos, but such a high video resolution means that the video file is going to be huge and difficult to upload quickly to some online video platform.